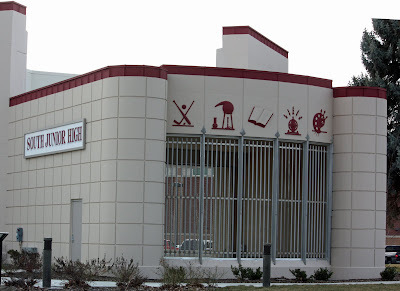 Boise Daily Photo: South Junior High: Mommy, is that a Jail? This stand-alone in front of the school I think is a remnant of the original building. It was an art deco-style building that some folks thought should have been refurbished, but instead was demolished. The bars that looked jail-like to my daughter might have been windows, but my memory of the building is confused by the new structure. I like the icons and the subdued colors. If only my husband were home - he could convert that line to html code! I imagine some students feel like they are in prison!